Welcome to the Stormwater Management with trees and structural soils project site. This project began in 2004 as a collaborative effort between the Urban Forestry and Urban Horticulture programs at Virginia Tech, the Urban Horticulture Institute at Cornell University, and the Department of Land and Water Resources at the University of California at Davis. With funding from the USDA-Forest Service’s Urban and Community Forestry Grants Program, we developed and evaluated a system for capturing and retaining stormwater under pavement in structural soil: a specialized soil mix that supports pavement and supports extensive tree root growth. 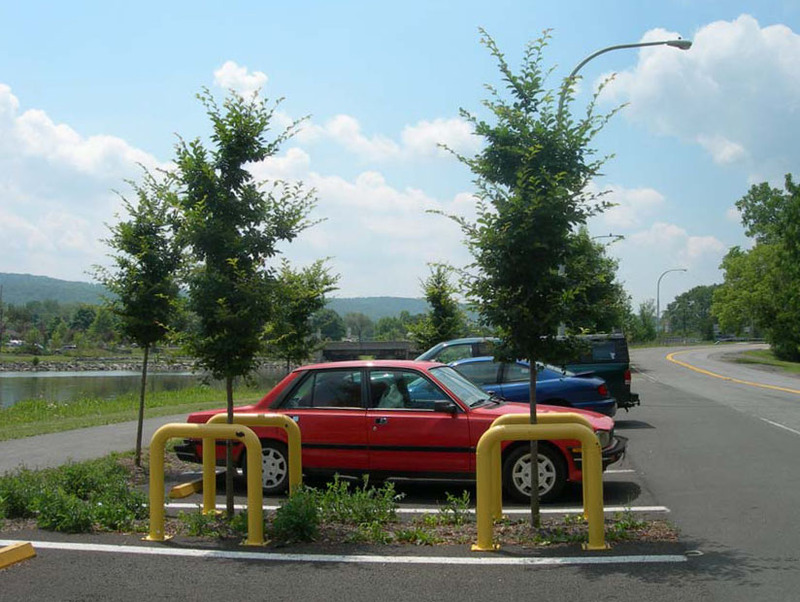 Our vision was a full-canopy parking lot that allowed trees to serve their natural role as mediators of the hydrologic cycle. This new technology puts another tool in the kit of municipal public works—especially those dealing with increased infill development. It can be put to use in streetscapes and plazas, as well as parking lots. This website provides many resources such as a BMP design manual based on our research, a presentation for explaining how this system works to your municipality or business, and many other resource links. Research continues to be published, but we hope you will find the answers to your questions on this site. Please feel free to contact us if you would like to discuss your plans or need more information. Thank you. This project was made possible in part by a grant from the United States Department of Agriculture Forest Service Urban & Community Forestry Program on the recommendation of the National Urban & Community Forestry Advisory Council (NUCFAC).